You are here: Home / Emerging trends & STEM / New Moon Girl Media Officially Launches on Founder’s Birthday! New Moon Girl Media Officially Launches on Founder’s Birthday! Bringing girls voices to the world, New Moon Girl Media’s online community vaults out of beta testing to be “born” on Founder Nancy Gruver’s birthday today! I’m getting ready to “launch” myself to pick up Nancy at the airport to stay with me here at mi casa before tomorrow’s Kids Online Unconference: Balancing Safety and Fun. So consider this my disclaimer that I indeed know and admire the site’s head honcho, who is also the author of How To Say It To Girls which has saved my tail in awkward tween talks many a time. Truth be told, I was a fan of Nancy’s work long before she became a colleague and trusted friend…in fact, one of my first events getting my feet wet in the nonprofit arena was sponsored by New Moon with Turn Beauty Inside Out and Mind on the Media. Now that she’s turning digital diva, after two decades of paper publishing as well, I see nothing but affiliation opportunities for carrying those ‘girl voices’ even farther. So congratulations to the tween teams and bold voices of New Moon Girl Media who have spent countless hours blogging and tweaking and tinkering the creative platform to make it an inviting haven for girls 8-12 to be real in a healthy environment of positive discovery during these influential preteen years. …Not just ‘happy’ for parents like me who applaud ad-free, subscriber-based, safe hubs for girls to share their dreams without being mined and marketed to a farethewell…but happy as in cheerful, upbeat whimsy. From a branding perspective, I’m sure there was considerable thought put into the ‘luna-moon’ girls-rising orbs, but to me it evokes futuristic thinking and bold retro-whimsy in ‘not afraid to be a kid’ style, which just shouts ‘alive’ to me loud and clear. Bold and beautiful. 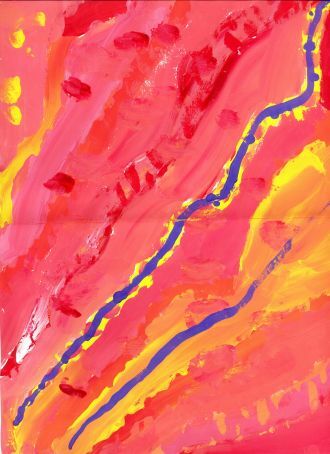 My eye goes right to the fabulous offerings, like, “body and feelings,” “changing the world,” “sister to sister,”(a great mentor bridge between Orb28 and 8-12s) “arts & culture” and of course, the kids creations themselves. Featured like an interactive gallery of high profile artists, each girl becomes a web celeb in her own right, able to showcase her talents and post her favorite pieces for comments, feedback, ratings, and discussion. It’s refreshing to see young girls use media like this to post their passions on profiles and share likes and dislikes freely instead of posing in ‘model’ style or trash talking about who dropped who from their top ‘buddy’ list, on sites they’re not even supposed to be ON. Educators might call it ‘participatory learning’…I just call it friendship fun. Here’s another example of girls baring their souls instead of their backsides, created by 9 year old poet Rebecca, originally from California now living in the U.K…. Her verse reads, “Talk about Magic–Talk about Tragic–It’s all Tragic Magic, But sometimes it has to happen–So step aside and just relax–You’re not the only one remember–So don’t feel left out–It’s all supposed to happen–So don’t worry–Cos it all will be gone in a hurry–So remember that–IT’S ALL SUPPOSED TO HAPPEN.” Hmn…Thanks, Rebecca, I needed that little reminder tonight…something to think about. 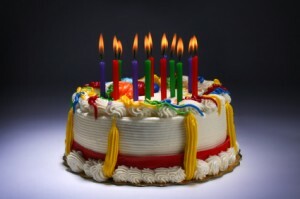 But since it’s her birthday, I say ‘let ‘em eat cake’…Too much work and not enough play makes Amy a grouchy media mama, and Nancy’s landing at SFO in a jiff and I want to have this posted in time! Our “takeover the blog” spoof was inspired by the “100% user generated content issues” (Budget Travel made a big splash with that this past spring) which seemed appropo since Newsweek reported publishers are going to great lengths to keep paper alive in the media sphere. I could go into a bunch of hybrid formats and twists on traditional magazine models (like Jpeg’s ‘American Idol for magazines’ approach with voting content up or down) —but frankly, I’d rather have some hang time with Nancy, pour a cup of tea, and go on ‘auto-pilot,’ signing off with her words and a birthday wish! Mine is for Nancy’s New Moon Girl Media to grow and thrive! 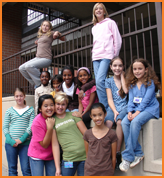 All Things Girl Week – what a great idea to pull together a wide range of girl-supportive websites and amazing groups! Girls and their families have been yearning for a safe online community, and we’re thrilled to now provide girls with a place where they safely create their own content, pursue their individual dreams and connect with girls their age. After sixteen years of featuring girls’ writings, drawings and poetry in our magazine, we’re bringing a fresh new forum for self-expression online with video, podcasts, and safe girls media on a global scale, specifically for preteens 8-12. New Moon Girls.com invites girls to explore their creativity beginning in each member’s own private “room,” where she can express herself through a variety of media. In the broader community, girls can choose to share their creations with one another and contribute to weekly themes and articles. 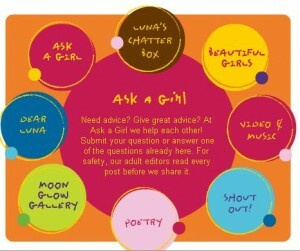 There’s also an “Ask a Girl” advice area, where girls help one another with supportive answers to questions and concerns. Other community features? Message boards across a wide range of topics, online chats with inspiring women and girls and access to all fifteen years of the girl-created content of New Moon Girls magazine. So who runs the show? Not just me, that’s for sure! All New Moon Girl efforts are guided by three groups: An Advisory Board of experts on girls’ development, Girls Editorial Boards, and specially-trained adult staff. And at the core of everything New Moon does is our “Share the Power” process. We see it as a way to bring together girls’ strengths with adults’ strengths to create a community that listens to girls, respects their voices, helps them support each other, and gives them reliable information and guidance. We’re looking forward to developing collaborations with many of the organizations Amy’s featuring this week on Shaping Youth. We can ALL do more with and for girls as we work together bringing our individual talents to the process. And, hey…it’s FUN!! This will become a really valuable resource in our house in a couple of years as my daughter approaches that tween stage. I love that it is ad-free! I teach preteen and teens and adults as part of community access programs at KMVT15.org in Mountain View CA. They pick up the technology faster than the older folks, and are genrally more eager to learn. Hey, not sure if this us who I should contact about this concern but on the hall of fame list there is a very offensive username that I feel is very wrong and inapproriate and I was just wondering what could be done about this situation. The person currently holds position #37. Thanks for your time.